Loving having waffles for brunch; sometimes with chocolate chips and other times without. 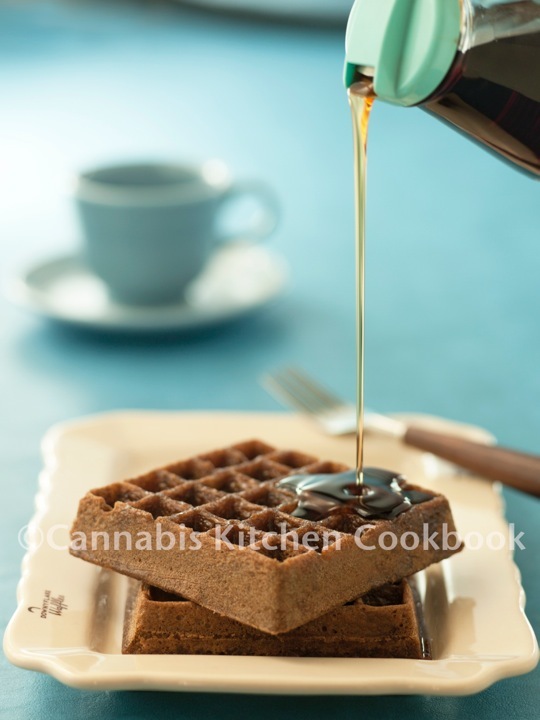 And here is a delicious, quick and easy recipe for Cannabis Waffles. Gluten free, and a very delicious meal for anytime of day. I love that in the Cannabis Kitchen Cookbook, all the recipes were tested before publication with THC info provided. Feel Good Food, recipe by Leslie Cerier from the Cannabis Kitchen Cookbook. Teff is a tiny grain with a mild, nutty flavor that grows predominantly in Idaho, USA and Ethiopia. High in protein, calcium, and amino acids, teff is ground into a gluten-free flour alternative that can be used to make all sorts of baked goods. Its name comes from the Greek phrase, maskai teff, which means “the grass of love.” Leslie Cerier can’t think of anything better to pair with cannabis, that other grass of love. She mildly infuses these healthy waffles with three tablespoons of cannabis-infused coconut oil for a slight morning buzz. If the potency is a little on the mild side, serve these waffles with optional cannabis-infused butter. Whisk eggs in a large bowl. Stir in juice, oil, maple syrup, and vanilla. Add flour, baking powder, and salt. Stir until well combined. Serve immediately or keep cooked waffles in a warm oven until ready to serve.